The definitive account of one of the greatest Special Forces missions ever, the Raid of Entebbe, by acclaimed military historian Saul David. On June 27, 1976, an Air France flight from Tel Aviv to Paris was hijacked by a group of Arab and German terrorists who demanded the release of 53 terrorists. The plane was forced to divert to Entebbe, in Uganda--ruled by the murderous despot Idi Amin, who had no interest in intervening. Days later, Israeli commandos disguised as Ugandan soldiers assaulted the airport terminal, killed all the terrorists, and rescued all the hostages but three who were killed in the crossfire. The assault force suffered just one fatality: its commander, Yoni Netanyahu (brother of Israel's current Prime Minister.) Three of the country's greatest leaders: Ehud Barak, Shimon Peres and Yitzhak Rabin planned and pulled off one of the most astonishing military operations in history. An authoritative account...written with aplomb. In “Operation Thunderbolt: Flight 139 and the Raid on Entebbe Airport, the Most Audacious Hostage Rescue Mission in History,” David performs his own kind of rescue: drawing on declassified government documents, diaries and interviews with former hostages and Israeli soldiers and politicians, he reclaims the story of the operation from the realm of legend and, in the process, reveals just how close it came to failing. Jumping back and forth between Israel and Uganda, the narrative is fast-paced and cinematic… The final third of the book is completely riveting and should be read in one sitting. The story of this ever more dramatic story...has been told many times on page and screen. But never better than British historian Saul David does in this meticulously researched, vivid account. He has a knack for making the reader feel he is right there, sharing the feelings of everyone from the hapless passengers to the brave, disciplined commandos and the agonized government leaders back home who had to take the leap of faith and courage to authorise a mission they knew could so easily go awry... The raid was one of history's truly stirring and awe-inspiring events, and Mr David's gripping book truly does it justice. This is a minute by minute narrative of that week by a scrupulous and thorough historian, who has written what will most likely be the definitive work on the subject and produced a tense and riveting account of what has come to be known as the Entebbe raid. By means of extraordinarily deep research, David essentially lets the characters speak for themselves... David is especially adept at explaining the decision- making process that takes place as a complex military operation is considered, planned and executed... David's exploration of the various conflicts generates a high level of drama and tension for the reader, even though the outcome is known. This is the achievement of a masterly, first-rate historian. He is also a master at detailing the chaotic action of combat... The great value of a work like Operation Thunderbolt is that it relights the dim corners of past events. Author Saul David...has nimbly woven a breathless romp across Europe, the Middle East and Africa. We see the ordeal of the hostages as they hopscotched on their way to Uganda; the Israeli government leaders juggling turbulent politics to develop a response; and the brutal and bumbling Amin as he tried to stay ahead of impending disaster... Operation Thunderbolt succeeds as a suspenseful read and a lesson in how one era's bogeyman, in this case Amin, can seem frightening and omnipotent at one point in time and then ridiculous in hindsight. Thrilling... 'Dozens of books and movies have tried to capture the menace and the romance of the operation, most famously “Raid on Entebbe,” the 1977 TV movie starring Peter Finch and Charles Bronson. It’s no wonder. The event sports a colorful cast of heroes and villains. 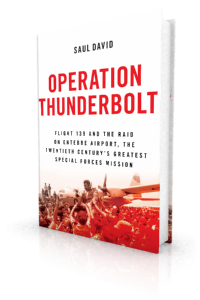 In “Operation Thunderbolt,” British historian Saul David relies on extensive interviews with the captors, kidnapped and rescuers to retell the story in a tick-tock trek from Tel Aviv bunkers to the airport in Entebbe. The effect is heart-racing. This gripping tale...has already been told in numerous books, feature films and documentaries.. But David’s version, which cuts back and forth between the key players and reads like a film script, should prove definitive. He has tracked down formerly classified documents in four countries. His meticulous reconstruction has also been enriched by recent interviews with hostages as well as Israeli soldiers and politicians and even a former terrorist. Not surprisingly, the rights to David’s book were quickly gobbled up by a leading European film production company. [David] brings thrilling detail to one of the most dramatic rescues in recent history.